Read part 2 of the Battle of Yarmuk here. "Women will no longer be able to give birth to the likes of Khalid bin Al-Waleed." Sitting on his Arab stallion on the hilltop Jumm’a, Khalid’s (RA) shadow cast forward as the sun rose behind him. Broad-shouldered, he folded his arms across his sturdy frame and ran the fingertips of one hand over his cheek and through his thick flowing beard. The battlefield lay sprawling before him like a game of chess; he mentally moved the pieces to corner the king. Across the scrubby Yarmuk plain, Khalid (RA) saw the glint off the amour as the morning sun struck the Roman line. Khalid (RA) gazed at the pomp and ceremony of the Roman army; silver armour resting neatly on top of their red tunics with a hint of gold. Impressive; but never judge a soldier by his pretty clothes, Khalid (RA) thought, smiling. After four days of hard fighting, the Romans could not deliver that final fatal blow! Waging war came naturally to Khalid (RA). He belonged to the Makkan tribe of Bani Makhzum. They were responsible for matters of war. As a Makhzumi, proficiency over the horse, camel, sword, spear, bow and lance was a minimum and Khalid (RA) had mastered them all. His father, the tribal chief, mentored him in tribal warfare tactics; the importance of speed, mobility and surprise. As he reached maturity, war became his main interest. Yarmuk would be Khalid’s (RA) greatest test and it would push the limits of his training and experience. Khalid (RA) dropped his glance at the base of the hill Jumm’a and observed his men. Between every soldier there was a wounded man leaning against another. Their spirit in the face of such overwhelming odds never wavered and he would not abandon them; even if it meant death. He glanced back at the Roman line. He may not have a professional army, he thought, but he had a thousand Companions of the Prophet (SAW) and a hundred veterans of Badr, from the first battle. They were all he needed and he felt comfort in knowing this. And yet, he was worried. How much longer could his men hold out? Another battle such as the one fought yesterday and his Bedouin army would have to disappear in the desert behind them. The Romans still had enough men to overwhelm the tired Muslims. What would the Romans do today. Movement in the Roman center caught his attention. The Romans separated to create a corridor of men through which a rider appeared. The rider kicked up dirt and a trail of dust rose up behind as he rode to the middle of no man’s land. Khalid (RA) watched. Surely this was not a Roman knight out to challenge the Muslims to a dual? Khalid (RA) ordered his deputy to meet the rider. The two emissaries met in no man’s land, their horses standing face to face inches apart. There was a verbal exchange. Khalid’s (RA) deputy nodded in understanding. The rider handed him a scroll, pulled on his reins and rode back to his line. The deputy reported back to Khalid (RA). The rider was Mahan’s emissary with an offer of truce. As the sun reached its zenith over the Muslim camp, the slaves tending to the camels overheard a passionate harangue inside Abu Ubaidah’s (RA) tent. Inside, the tent lacked any ornamentation. An old faded rug with some worn out cushions covered the ground. All of the senior commanders sat on the threadbare rug in a semicircle with Abu Ubaida (RA) at the head. The decision to accept or reject the truce rested with Abu Ubaida (RA) as Supreme Commander of all Muslim forces in the Syrian theater (Abu Ubaidah (RA) had delegated command for Yarmuk to Khalid (RA)). Many of the Corps Commanders argued to accept the truce. “This is victory,” they passionately argued. “The men are tired, wounded and we’re heavily outnumbered” they pleaded. “We fought a much larger army deep within enemy territory; we can leave with our honour intact and come back to fight another day.” Their words had an impact on Abu Ubaidah. Khalid (RA) quietly listened to his fellow comrades. Their arguments were sound but they missed the bigger tactical picture. Khalid (RA) folded his arms across his great chest and bowed his head down. Now was the time to be decisive he thought. The strategy was to remain on the defensive, wear out the enemy, then pounce. After four days of heavy fighting the Romans had lost their will to fight. It was now his turn. He could see the future battle play out in his mind like a game of chess. Even in the face of such over whelming odds he saw the path to victory. The brilliance of Khalid bin Waleed (RA) would be illuminated in these final two days. He selected the plain of Yarmuk because of lessons he’d learned from the Persian campaign. He defeated the Persian army at Kazima only to see its remnants turn up at Qarin. He realized that he could not fight a war of attrition against the imperial armies. He conceived a tactical solution and at Walaja he mastered it. He enveloped the Persian army and annihilated it. It was a stroke of genius and this would become his standard operandi. 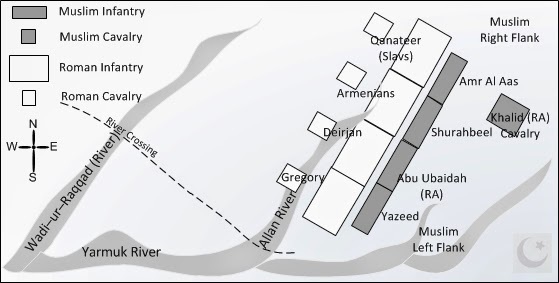 At Yarmuk, his tactic would be different but the objective was the same. He selected Yarmuk because of a hidden trap. To their horror, the Roman generals would not realise this until it was too late. When Khalid (RA) raised his head to speak, there was a hush in the tent. His reputation commanded attention. His battlefield record was unmatched not only in the number of victories but the brilliant manner in which he attained those victories. Khalid’s (RA) words carried weight. “Bismillah” he started by invoking the name of Allah. He continued in a deep tone and a deliberate pace, “these past four days have tested our resolve. But now is not the time to concede, when the fruits of victory are within our grasp.” Khalid (RA) rejected Mahan’s offer. Khalid (RA) spoke about the heroics of the past four days. He reminded his men of their strategy and presented them with his plan. Abu Ubaida (RA) and the other commanders listened with their eyes staring at the faded rug out of respect for their great general. If the person speaking was anyone other than Khalid (RA), they would probably have rejected his plan. But this was not just any person. This was Khalid (RA), son of Waleed. Once Khalid (RA) finished, there was silence. Only the fluttering of a loose tent canvas could be heard. Abu Ubaida (RA) paused. No one spoke. The matter was settled. The Muslims would fight! As the afternoon heat gave way to a cool evening breeze, the rank and file relaxed for a well-deserved break. Many spent the day in prayer and remembrance of Allah, as was their habit. Khalid (RA) spent the remainder of the day reorganizing the troops for the counter-offensive. He gave orders to the various commanders and squad leaders. He combined the 4 different cavalry regiments into one powerful mounted force totaling 8000 mounted warriors. This new cavalry unit was placed behind Amr Al Aas’ division on the right flank. The news about the plan spread throughout the army; not one soldier objected. After all they had been through over the past 4 years the; destruction of the imperials armies from Constantinople and Persia, the overwhelming odds they faced at each battle this, was just another stroll through the desert. Their Iman was strong, they had faith in their leaders and they had complete confidence in Khalid (RA) as their general. Akram. 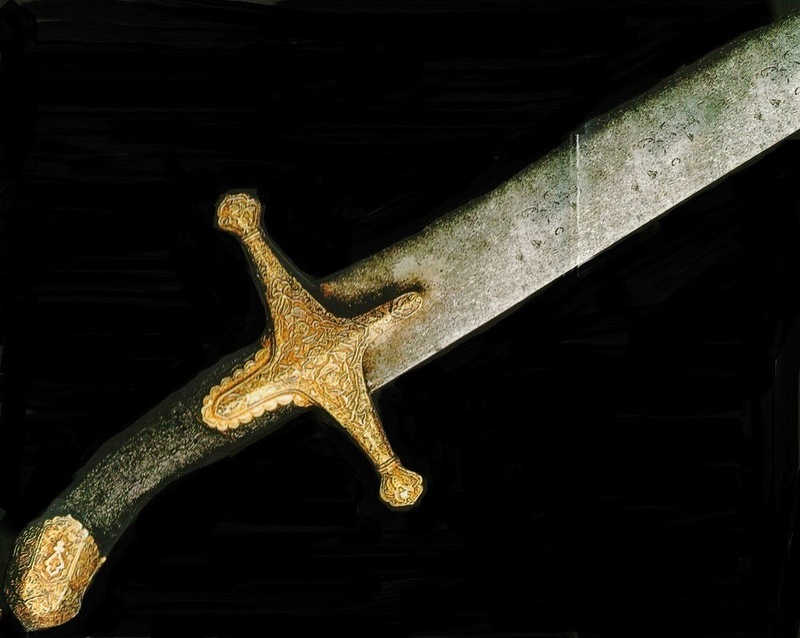 A.I.”Khalid Bin Al-Waleed: Sword of Allah.”Birmingham: Maktabah Publishers and Distributors, 2007.